Come one, come all to the Circus and the City at the Bard Graduate Center! See how P.T. Barnum’s circus evolved in to Ringling Brothers and Barnum & Bailey! See the advent of the circus parade with its menagerie of animals (including elephants), carved figures and floats (prefiguring the Thanksgiving Day Parade). Learn how the circus influenced the birth of a whole new form of graphics and poster art including wood engravings and chromolithograpy producing the famous circus ads that look so much like watercolors and owe a debt to the work of Toulouse-Lautrec. Barnum’s Roman Hippodrome the Largest Place of Amusement in the World, Occupying the Entire Block between Madison and Fourth Avenue…was how one read. See an advertisement for the circus in Yiddish and understand how the circus as a non-linguistic form of entertainment transcended the language barriers of an immigrant population. 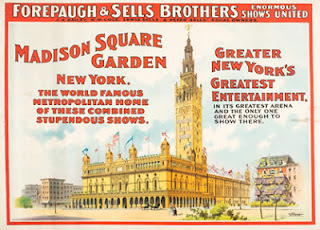 Learn how the Hippodrome preceded Madison Square garden and see the photographs of the lusus naturae, “human wonders” which included both born and made freaks like a bearded lady and a creature covered with tattoos. See General Tom Thumb’s outfit, his tiny pants and miniature fiddle. See the film of Tiny Kline swinging l000 feet in the air on her Iron Jaw! Remember how the circus influenced Fellini’s imagination in films like La Strada and 8 1/2. Appreciate the European influence, the clowning from commedia dell’arte and acrobatics from gypsy culture! Come one come all!